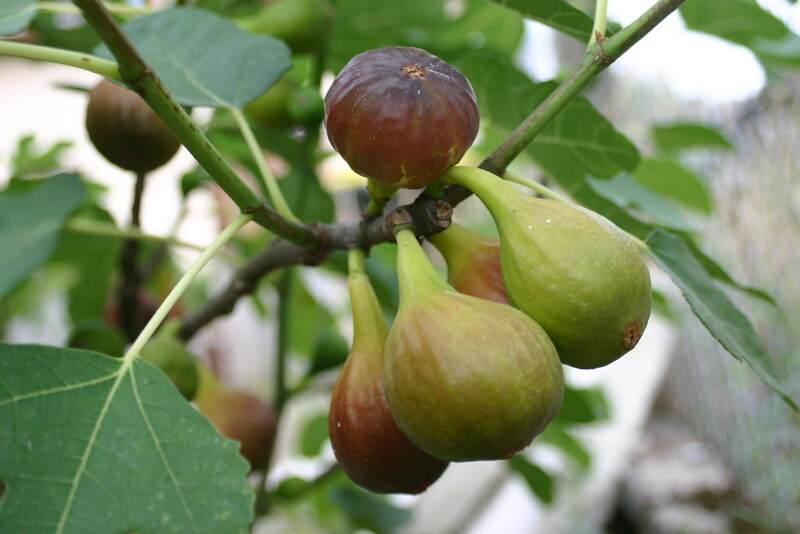 Figs (Ficus carica) may just be one of the best trees for edible landscapers and urban gardens. They produce an abundance of delicious sweet fruit while thriving amid brick and concrete in containers or small spaces, and provide bold, beautiful foliage in the garden. They are also virtually pest free and practically immortal. I’m not the first to recognize the near perfection of figs. Figs have been cultivated for thousands of years and are thought to be among the earliest plants domesticated by humans. What our ancestors no doubt realized, and what new generations are rediscovering today, is that figs are an easy-to-manage tree that provides an abundance of luscious fruit. Hardy in USDA Zones 7b through 11, figs can survive and indeed thrive in cooler climates when planted in the right location. In Brooklyn, figs appreciate the urban heat-island effect from pavement and buildings, which keeps their roots from freezing. Figs are sun-loving trees and do best in the Northeast when grown in heat-hoarding microclimates, such as near foundations where the heat from the building helps keep the soil warmer through winter or against a south-facing wall to benefit from the radiant heat. Figs can also be grown in containers if they have winter protection. The container should be no smaller than five gallons and during colder weather needs to be moved into a protected area like an unheated garage or small shed where the temperature won’t fall below 30°F. Figs in unprotected locations can be wrapped to protect them from freezing temperatures and drying winds. 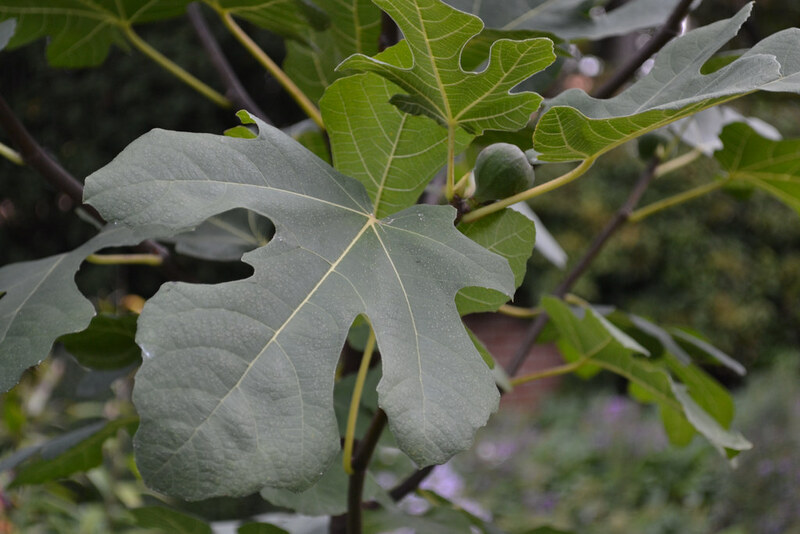 Unlike many commercially cultivated fig varieties grown in the Mediterranean and California, which require a symbiotic relationship with fig wasps to produce fruit, common figs are parthenocarpic, able to produce edible fruit without pollination. This is because what we call the “fruit” is in fact an enlarged stem covering the flower. Of course, nonfertilized fruit is seedless. Thankfully, fig tree propagation is easy, in part because of its suckering habit. By taking a division of the tree and planting it, you create a clone plant that can be passed from generation to generation. One of the most common ways to propagate a fig tree is to prune it in fall and take several leafless, pencil-thick cuttings, bundle them, and bury them horizontally in the ground below the frost line. Over the winter the cuttings will callus and make roots. In the spring, dig up the bundle and insert the cuttings, rooted tip down, in the soil. Given even moisture and protection, top shoots will soon appear and eventually develop into a fruitful tree. Figs can be kept small by pruning them as shrubs, allowing them to be grown in the smallest of backyard spaces—a boon for urban edible landscapers. The sap of certain figs can be a skin irritant, so be sure to wear gloves when pruning. The large, deeply lobed foliage of shrub-pruned figs looks great planted near other shrubs like rhododendrons and roses. Even better than its gorgeous foliage, of course, is the fruit. Figs vary in color from yellowish green (called white figs) to copper, bronze, and dark purple. The flesh can be pink, tan, or a soft white. There are several hardy cultivars that do well in cooler climates, including Ficus carica ‘Brown Turkey, which has medium to large copper-colored fruit. ‘Celeste’ is another great choice, with smaller fruit that is a purplish-brown color. ‘Hardy Chicago’, which has small to medium fruit with purplish-brown skin and strawberry-pink pulp, also does well. Many fig cultivars produce two crops per year. The first crop, called the breba, arrives in early summer on the previous year’s wood. The second crop forms in late summer or early fall and stems from the current season’s growth. Knowing when to pick your figs is as simple as watching the fruit. As they ripen, figs droop from the tree and soften. The longer you can leave them on the tree the sweeter they will be. The best time to harvest is right before they fall from the tree, when you begin to see sugary syrup bead up on the skin. Figs do not last long once harvested, even when refrigerated, and are best eaten fresh off the tree or baked into cookies, tarts, jams, and other sweet treats. Preheat oven to 350°F. In a mixing bowl, cream sugar and butter and add beaten egg. In a separate bowl, sift together dry ingredients. Blend into sugar mixture at low speed. Use a spatula to fold in figs and nuts. Drop dough by spoonfuls on greased baking sheet. Bake for 15 to 20 minutes. Store cooled cookies in an airtight container in the pantry for up to a week. Makes about 3 dozen cookies. Adapted from a recipe by the California Fresh Fig Growers Association. Robert Newgarden is a former gardener at Brooklyn Botanic Garden. He tended the Cashew Plant Family and other plant families in the Plant Family Collection. He also cared for the Herb Garden. The white fig is much larger than the black fig. I had some in Europe. Can you grow it here? Can you please teach me about fertilizing and planting my fig. I understand about the south facing wall. Please instruct about depth, width away from the foundation and fertilizing. 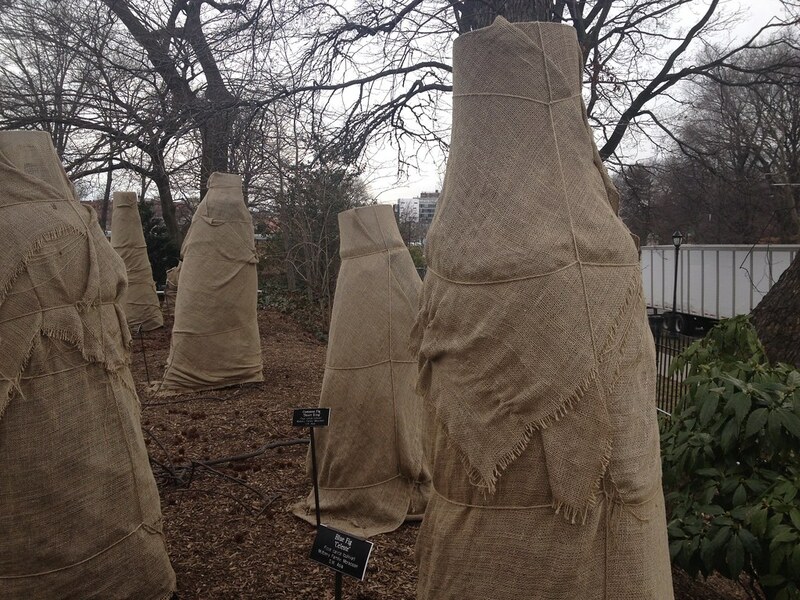 Protection from elements in winter is one thing, but one also needs to protect figs from hungry rodents, who easily girdle a tree because they are safely protected from predators by insulating burlap. We’ve had far more success wintering dormant figs in large pots stored in a cool dark place. Does the ‘Brooklyn Dark’ fig have a more common name? I’m trying to find one. If by “insect free” you mean pollinated without the aid of insects, yes, except for Smyrna and San Pedro figs, which require a wasp for pollination. Are figs truly insect free? Thanks a lot. Ficus carica (hardy fig) growing in BBG's Shakespeare Garden. Photo by Elizabeth Peters. Ficus carica (hardy fig). Photo by Céréales Killer. 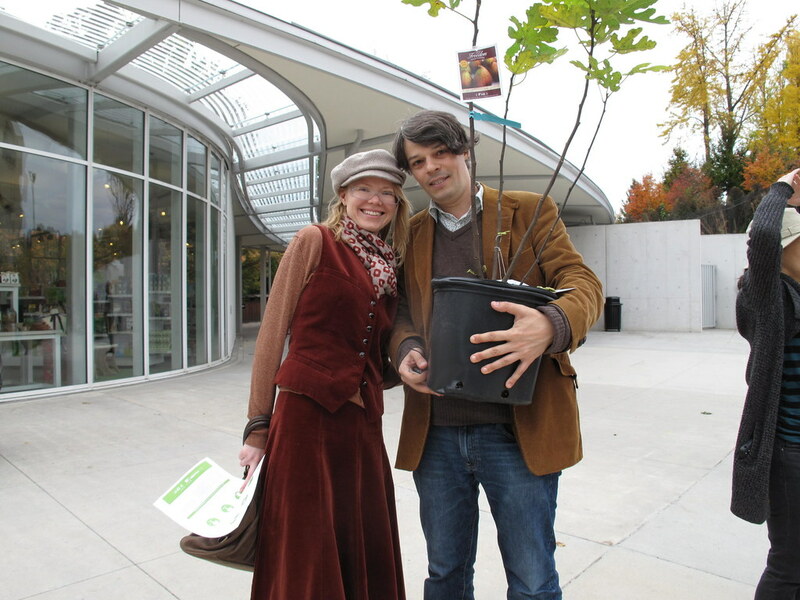 Fig trees grow well in a small Brooklyn backyard and are a popular choice for community tree giveaways. Photo by Nina Browne.